When asked “While emperumAn stands ahead and creates interest in him among the samsAris, why are these people following various other dhEvathAs (deities)?”, AzhwAr says that even if they do so, the deities that they hold on to, ultimately attain emperumAn. avar avar – it is said that “lOko binnaruchi” (people have different tastes). Some people of the world will have excess of rajO guNa (such people will be very passionate about everything) while others will have excess of thamO guNa (such people will be very lazy, will be ignorant and will be disinterested in anything). AzhwAr calls such people as avar avar, indifferently. thAm thAm aRindhavARu Eththi – such people who have rajO and thamO guNas will also have appropriate knowledge only. They will not follow SAsthras (scriptures). They will worship as per their knowledge. ivar ivar em perumAn enRu – they will hold on to some deity or the other and say “he is my swAmy (my Lord)”. When the sons of King sakara went searching for their aSvamEdha horse (horse let out freely to denote their boundaries), they started catching anyone that they came across as “you only stole our horse”. In the same way, these people will hold on to anyone that they fancy and denote him as their perumAn (supreme entity). Just as some people leave out good materials and have liking for neem and onions, these people will leave out the supreme entity SrIman nArAyaNa and and go after deities with inferior qualities. rudhra (sivan) says in harivamSam 138-8 “sathvanishtA hi purushA:” (people with sathva guNam (purely good qualities) should always meditate on hari (SrIman nArAyaNa)) and “harirEkas sadhA dhyEya:” (only hari should be always meditated upon). suvar misaich chArththiyum vaiththum thozhuvar – they will worship their deities after drawing their forms on walls and/or installing their deities as idols in some places. [Even] If emperumAn incarnates in some forms to shower his grace on people, they will offer their prayers to these deities instead of to emperumAn. 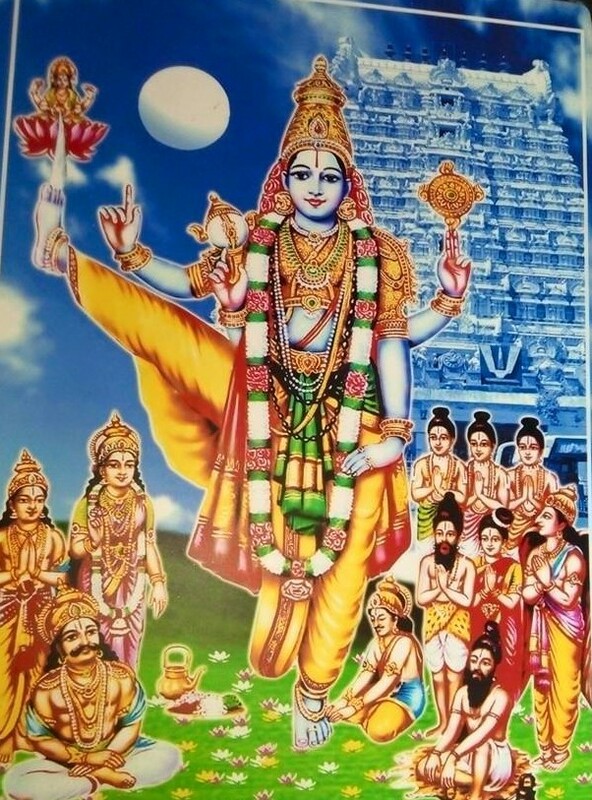 Even if they carry out such worship…..
ulagu aLandha mUrthy uruvE mudhal – the form of emperumAn which he took to keep all the people of the worlds under his divine feet [thrivikrama], is the primary one. Did he not keep his divine feet on those who are holding on to other deities and on those deities too to measure the worlds! We shall take up the 15th pAsuram next. This entry was posted in iyaRpA, mudhal thiruvandhAdhi on June 23, 2017 by T N Krishnan.